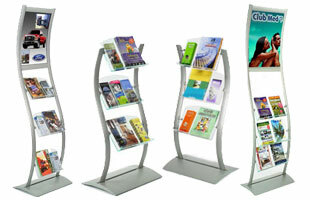 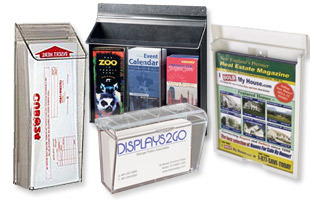 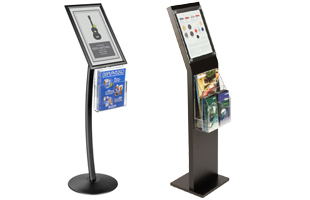 These brochure displays and racks are offered in all kinds of unique configurations. 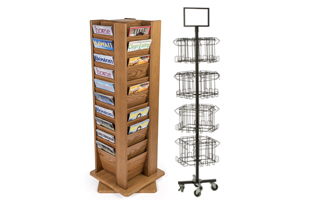 Choose from a large assortment of in stock & ready to ship designs, including plastic and acrylic as well as wood pamphlet display racks. 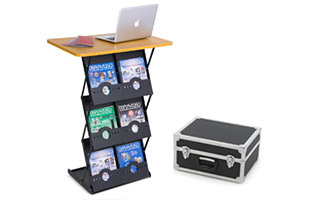 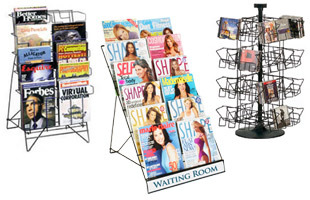 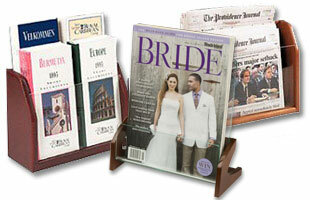 These brochure racks are great for distributing your company's literature, take-out menus, school pamplets, and more! 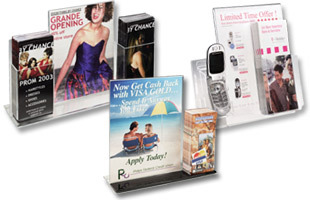 The pockets are designed to hold any tri-fold information from flyers & handouts to magazines & promotional offers. 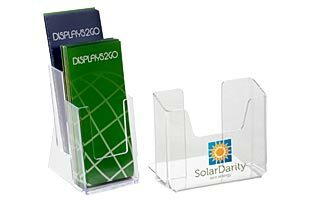 Just one acrylic pamphlet rack is certain to change the way your business operates by making information more readily available to customers! 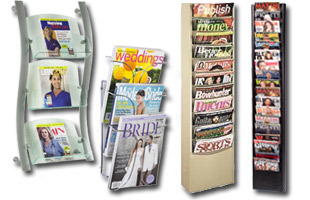 The dispensers are available in different sizes to fit your magazines or brochures and different styles to fit any setting. 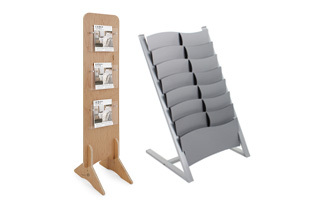 As an added bonus, many of these stands ship in the same day they're ordered! 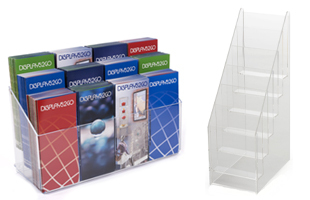 These include acrylic sign holders as well as plastic leaflet displays. 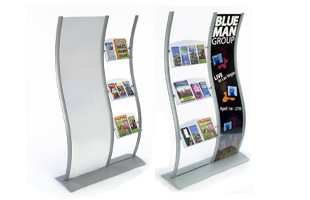 Choose from single frame with a brochure holder or business card holder attachment or floor standing poster frame with flyer holders. 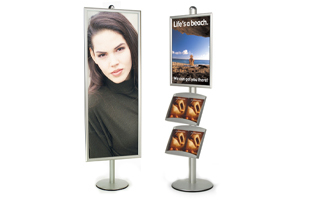 Our racked acrylic displays also come in styles such as vertical, angled, or table tent designs. 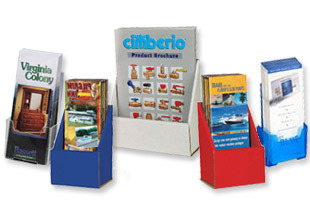 To find the right plastic pamphlet displays to meet your point of purchase needs, click on one of the images above to view more details. 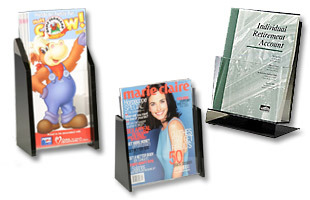 This series is available in many designs including: countertop, rotating, dome-designed, tiered, curved, convex, and more. 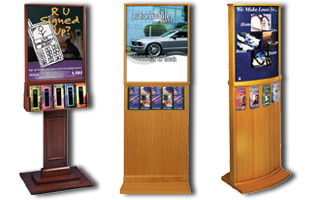 In addition to retail displays, we offer a large selection of product merchandising tools and fixtures at our main page.